Currently, nearly 30 percent of the members served by Indiana-based health services company Seniorlink have a diagnosis of dementia. These members have multiple comorbid conditions and often exhibit challenging behaviors, leading to a higher rate of hospitalizations and emergency department utilization. The caregivers for these members often are overwhelmed and frustrated, experiencing a high degree of caregiver burden. Seniorlink’s Caregiver Homes provides case management services to various Indiana Medicaid programs. Seniorlink looked across its network and identified the state of Indiana as an appropriate region to implement its VOICE for Dementia Care pilot for a couple of reasons. First, as mentioned, nearly one-third of those served by Seniorlink Medicaid programs in Indiana has a diagnosis of dementia. Second, Seniorlink has a strong working relationship with Indiana’s Division of Aging and are partners in supporting family caregivers. VOICE for Dementia Care is a technology-based care management system that provides professional coaching and advice for family caregivers, guided by tailored protocols and supported with a collaboration platform, Vela. The Medicaid programs implemented the VOICE for Dementia Care pilot as a means to further enhance the impact they were already making and to address the specific challenges faced by caregivers of persons with dementia. Seniorlink now is making this technology available to health plans and providers, with pilot findings proving there is value in leveraging its Vela technology to connect family caregivers and existing care teams to a remote coach. “The challenges posed by dementia meant those caregivers needed additional, dementia-specific support and coaching, beyond what is provided by existing care teams through Seniorlink’s program, who provide general caregiver support,” explained Jennifer Trowbridge, state director for Seniorlink’s Caregiver Homes Program in Indiana. “We created VOICE for Dementia Care to meet that need, a program that connects family caregivers with a professional coach through Vela, Seniorlink’s care collaboration platform,” she said. The coaching is guided by evidence-based clinical protocols. By helping caregivers manage the challenges of dementia, VOICE for Dementia Care aims to reduce the rate of unplanned hospitalizations and emergency room visits for the member as well as decrease the level of burden felt by the caregiver. The coach also partners with existing care teams through Vela in order to ensure any changes in care planning or goals are communicated. There are a variety of care collaboration platforms on the health IT market today. Vendors include Carestream, Careteam, DrFirst, eXo Platform, PerfectServe and Wipro. During the VOICE DC pilot, the Vela platform enabled Seniorlink to connect family caregivers of members with dementia as well as existing care management teams, all based in Indiana, with a VOICE for Dementia Care coach based in Massachusetts. The coach conducted an initial risk assessment on both the member and the caregiver to determine a family-centered curriculum, guided by clinical protocols. The coach engaged caregivers and the care teams primarily through Vela’s HIPAA-secure messaging app, sharing information including photos and files as needed, as well as simple text-based messages. Throughout the pilot, the coach conducted ongoing assessments through Vela to modify the content discussed and meet caregivers where they are in their journey. Important to note: The coach is remote, and this is key as the coach is easily accessible when needed; and in more rural areas, having a coach at the ready allows families and care teams to feel connected, Trowbridge stated. VOICE for Dementia Care helps coaches meet caregivers where they are in their knowledge, communication, confidence and care skills, she added. Vela anchors the VOICE program, and the pilot results demonstrate that compassion and empathy can be delivered through an app, she said. 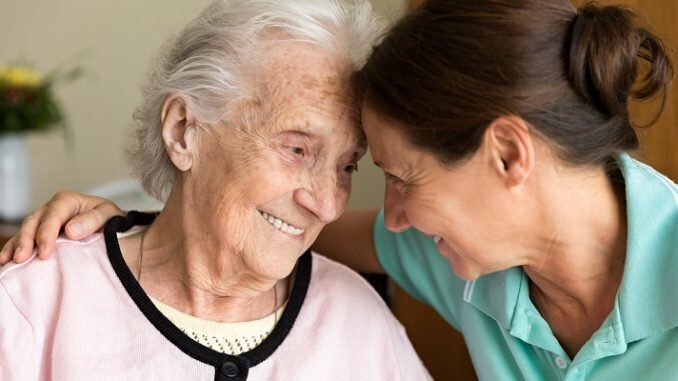 The results of the six-month pilot showed a 20 percent decline in caregiver burden, such as a reduction in their physical and emotional stress; a 13 percent increase in caregiver confidence; a 17 percent increase in caregiver knowledge; an 18 percent decrease in hospitalizations; and a 51 percent drop in emergency department visits. The family-centered approach is critical to meeting caregivers where they are in their journey – cookie-cutter, one-size-fits-all solutions will not be of value, said Trowbridge.